"I had never heard of quinoa until I went to Peru and discovered a delicious, traditional soup. There are a lot of ingredients, but it is worth the work!" Heat the vegetable oil in a large pot on medium-high heat. Stir in the quinoa, carrot, celery, onion, bell pepper, and garlic. Cook for a few minutes, until lightly browned, stirring frequently. 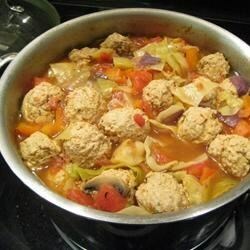 Pour in the chicken broth, water, tomatoes, and cabbage. Increase heat to high and bring to a boil. Reduce heat to medium and simmer until the quinoa and vegetables are tender, about 10 minutes. Season to taste with salt and pepper. Garnish with parsley before servings. I haven't made this recipe...I just want to know what the big balls of stuff are in the picture??? This soup was great! I did add potatoes and about 1 tsp cumin. It was very flavorful and all those veggies were so refreshing!